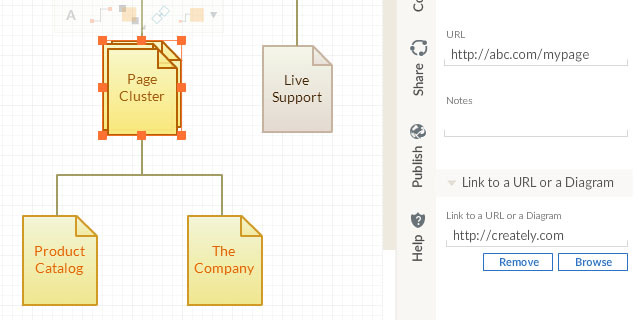 You can create 2 types of links in Creately diagrams. The first is to make Text entered in Creately into web hyperlinks. The second method, described here is more useful and is great for Sitemaps, Wireframes, Org Charts, or any complex diagram that has relationships to other diagrams. Click on an Object in the editor and click Properties tab to open the Right Panel. In the Properties Panel, you can either type in a URL to a webpage (e.g. http://creately.com) or Click Browse to create a link to a Creately diagram. Select a diagram from the dialog and click ok. The object is now linked to this diagram. Mouseover the object to see a blue link icon. 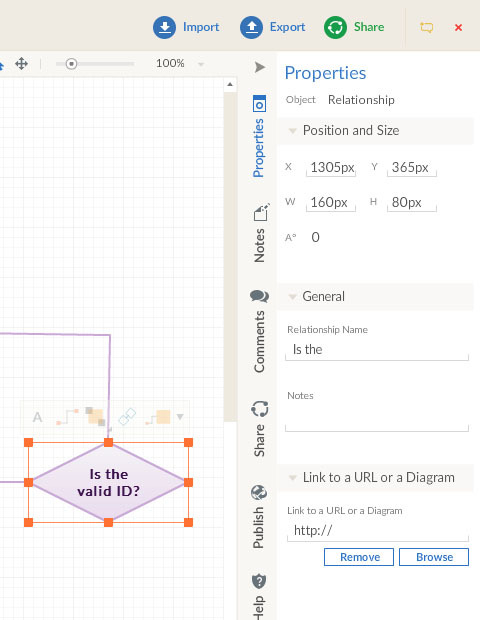 Clicking this link will open the linked diagram in a new Tab in Creately.